If we liken one's body to a book, the skin is the dust jacket . By examining the title, looking over the cover image, and reading the liner notes, it is often possible to determine what might be going on inside. So, for the careful observer, one can tell quite a bit about the internal workings of the body by examining the skin. The distribution of a rash is often helpful in coming up with a list of possible diseases (differential diagnosis). 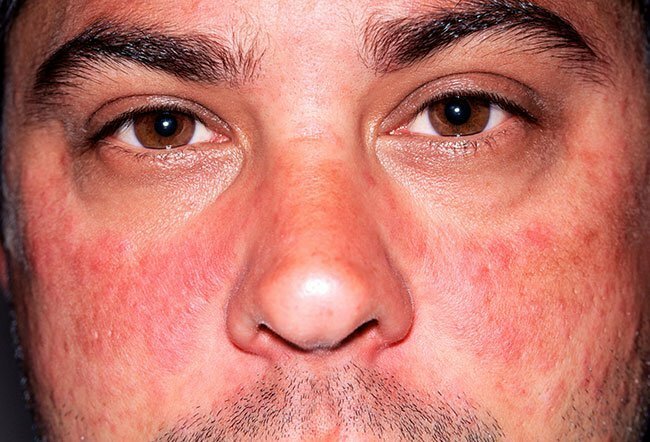 For example, a rash on the cheeks that involves the bridge of the nose can be a sign of a number of conditions, including rosacea, seborrheic dermatitis, contact dermatitis, and lupus erythematosus. Although the distributions may be identical, other findings enable your doctor to differentiate these conditions. Only lupus generally involves the internal organs. Necrobiosis lipoidica characteristically appears on the shin(s) and has a vaguely circular shape and a brown-yellow color. It often appears to be depressed. Many but not all of those afflicted have diabetes. The presence of this condition and the control of the diabetes are not directly related. 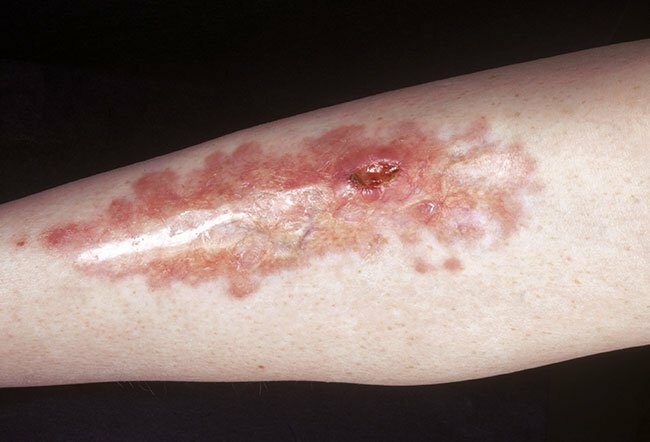 Lichen planus can affect both the skin and the mucous membranes. It is typically itchy. It appears as small, flat-topped brown to gray bumps with some scaling. Although very uncommon, there may be some association with hepatitis C infection. Most patients are healthy with no internal disease. 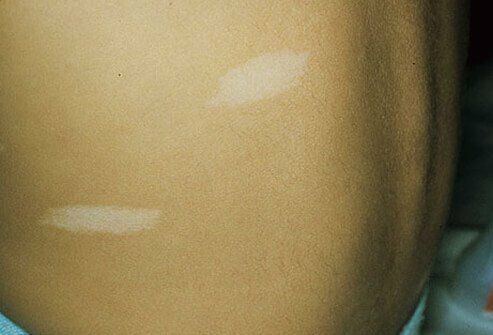 These white patches are devoid of color and often first noted soon after birth. To some doctors with a botanical bent, they look like ash leaves. 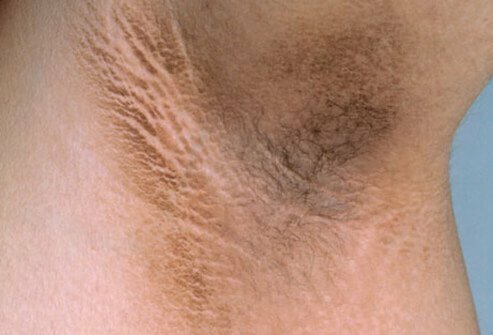 They are only one of a number of skin findings found in a rare systemic disease called tuberous sclerosis. This very serious genetic condition may involve the brain and kidneys. Sometimes the skin findings are so subtle even those affected may not be aware of their existence. Due to an increased understanding of its molecular cause, there are drugs that can improve its symptoms, which include seizures and mental retardation. Tripe is boiled beef or pig stomach. How closely these palms resemble tripe is debatable, but this term has stuck nevertheless. 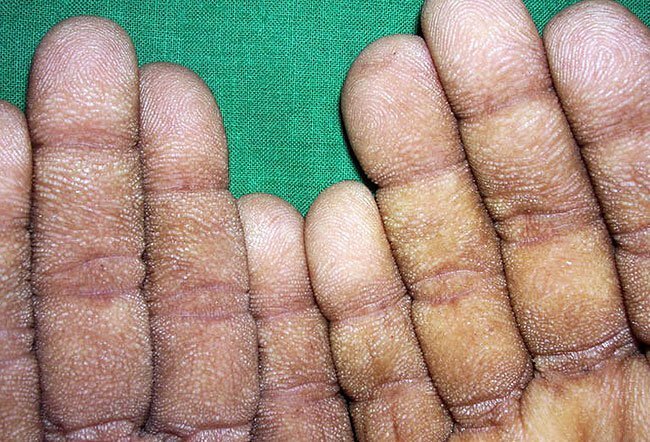 This peculiar thickening of the palms is often associated with acanthosis nigricans and signals the likely association of an internal malignancy. This peculiar thickening of the skin of the arms and legs is unique to some patients who are in renal failure and who have had imaging studies enhanced with gadolinium chloride. This contrast agent is no longer used in patients with poor kidney function, so this condition ought to be vanishingly rare. 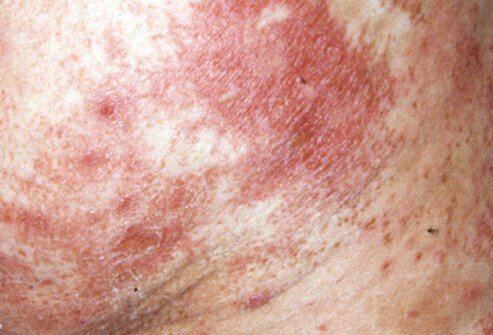 Necrolytic migratory erythema is not an easy diagnosis to make. The skin eruption is rather nonspecific and tends to occur in the folds of the groin, the buttocks, and around the mouth. The tongue can be quite sore. It is often confused with a simple fungal infection at first. A pathological examination of a skin biopsy from the rash can be quite helpful. 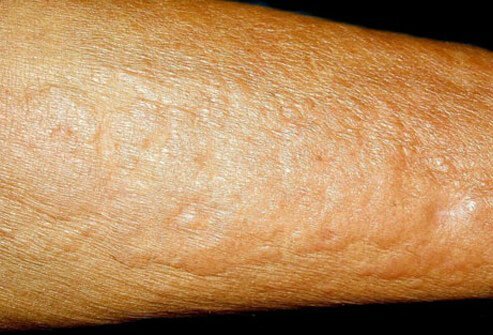 The patient often has an elevated blood sugar because this rash comes from a tumor in the pancreas that produces glucagon. 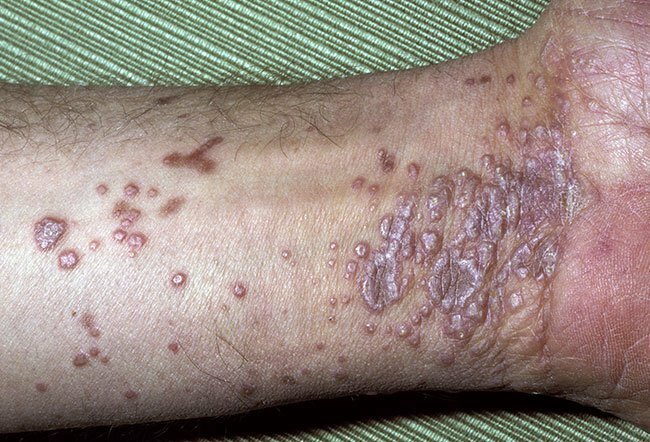 Granuloma annulare is not rare. Typical lesions are asymptomatic and ring-shaped with a bumpy edge that can gradually extends outward over a period of months. Most of those afflicted are otherwise healthy. American Journal of Clinical Dermatology: "Cutaneous Lupus Erythematosus - Issues in Diagnosis and Treatment"
Anais Brasileiros de Dermatologia: "Association of Acanthosis Nigricans and Skin Tags with Insulin Resistance"
Clinics in Dermatology: "Skin Signs of Systemic Diseases"
Current Neurology and Neuroscience Reports: "Molecular Therapies for Tuberous Sclerosis and Neurofibromatosis"
Cutis: "Lichen Planus - An Update and Review"
Dermatology Online Journal: "Granuloma Annulare of the Palms"
Dermatology Online Journal: "Tripe Palms Associated with Malignant Acanthosis Nigricans in a Patient with Gastric Adenocarcinoma"
Journal of Clinical Neuroscience: "MRI Safety - Nephrogenic Systemic Fibrosis and Other Risks"
Journal of Cutaneous Medicine and Surgery: "Is Necrolytic Migratory Erythema Due to Glucagonoma a Misnomer?" Seminars in Cutaneous Medicine and Surgery: "Necrobiosis lipoidica"